I got the idea to do a discussion on New Year’s goals/resolutions, especially bookish ones, the other day when I was thinking about my reading goal for the year. So with 2017 having just begun, I wanted to discuss reading/book related goals for the year. I love setting myself goals. Whenever I do this, for just about anything, it makes me much more motivated to do it and accomplish it. But sometimes we put so much pressure on ourselves to accomplish these goals, it’s not good. And then you feel bad because you were unable to reach your goal, which isn’t good either. There are so many great things about setting goals though, which is why I’m going to be discussing the pros and cons of it. Like I said, setting myself goals really helps me to feel more motivated and get! it! done! This isn’t just for reading goals, but in general. I know if I wasn’t setting myself goals, I would still be reading a lot, but I wouldn’t feel as motivated to do it. I don’t know about you, but reading goals make me want to read that many books. So that’s mainly why I do it, so I feel motivated and really pumped to accomplish it. No! This makes me so sad when I see/hear people doing this. 🙁 Please don’t put too much pressure on yourself just to reach a reading goal. Seriously, if you don’t complete your goal, that’s 1o0% fine! I will admit to doing this sometimes, too, but it makes me so sad. I want to be trying hard to achieve my goals but still having fun and not feeling really pressured. in contrast to my last point, this is one of the worst feelings in the world. I also hate seeing this. Just because you read less books than most people in a year, doesn’t make them any better than you, okay? I see some people feeling bad about themselves because they’re slow readers or can’t read a ton of books because life which makes me sad. Honestly, no one cares if your goal is low or high, because your goal is entirely for you! There’s no point in having a goal if you’re just going to feel bad and compare yourself to other people. And I’m not saying that to be harsh. I really don’t want people to get worried about people judging them, because trust me, they aren’t. My 2017 is going to be a lot crazier than m 2016, so I set my goal a bit lower than last year. In the fall I’m starting a new school. I know that’s going to take up a lot of time. I’m also traveling for a little bit in the summer and leading up to that I want to get a lot of work done so I have enough money for my trip and enough to still spend on books. So yeah, I already know this is going to be a much busier year for me. That’s why I set a goal that I know I can achieve without feeling pressured to finish it. 🙂 Which I hope all you do, too! This goal is really important to me! I read some diverse books in 2016, but not nearly enough. So this year I plan to read more books about mental illness and LGBT+ characters, which are two types of books I don’t normally read. Naz @ Read Diverse Books is hosting this awesome quarterly link up for diverse books you’ve read and reviewed. I’m really excited to take part in this challenge, and it will definitely motivate me to read more diverse books! Not really a reading goal, but still. I’m not normally one for New Year’s resolutions, so that’s why my list is so short. I really want to finish my novel though by the end of the year. I plan on participating in Camp NaNo this spring then NaNoWriMo in November, but I want my novel done before the latter. Because I just hit 60k and there’s still so much left, I know I’ll have to work hard to finish it. What are your goals for 2016? Do you like setting goals, or no? Also, are there any classic books you recommend? Let me know down below! Oh I loved this post- I think you brought forward everything necessary really well, Adalyn! I’ve decided to bring down my goal to 50 this year because it’s my final year at uni and things are only going to get tougher from now on. I’m taking part in Diversity Bingo this year and I just set my tbr for it, so that’s 36 books I’ve planned to read so far xD It IS good to have a goal, but I feel slightly overwhelmed too. Let’s see how it goes, lol. Good luck with everything this year! Thank you so much, Ruzaika! Yeah, I knew this year was going to be much busier than last, so I set my goal lower. Goals can be really overwhelming though. Good luck with your goals this year! Your pros and cons for setting reading goals are so accurate! I’ve definitely set my goals too high before. I think at one point last year I was something like 30 books behind schedule, so I adjusted it to something a bit more reasonable. I usually just take a guess for my Goodreads goal – something that’s close to how many books I read the previous year, adjusted a bit if I know a year’s going to be busy. This year, I’m doing a lot more specific challenges – for rereads, backlist books, series enders, and 2017 debuts. I’m not really sure how that’s going to work out, since it’s something I haven’t done before, but I’m excited! Classics: The Great Gatsby by F. Scott Fitzgerald, Pride & Prejudice and Northanger Abbey by Jane Austen, To Kill A Mockingbird by Harper Lee, and Macbeth by William Shakespeare. 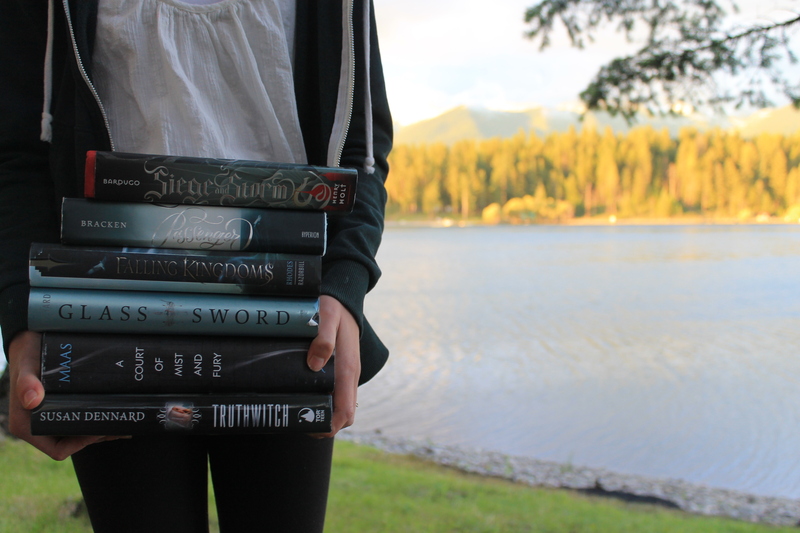 I also wrote a post ages ago with classics recommendations based on some YA books. (Okay, so that’s a lot.) I hope some of those help! Thank you for all your recommendations! I really appreciate it <3 Pride and Prejudice, Simon vs the Homo Sapiens Agenda, and I'll Give You the Sun are all on my TBR, but I'll have to go check out the rest of those. I agree, goals are great because they motivate you and guide you and then make you feel accomplished when you achieve them! But they can also put pressure, and if you start falling behind or something, you just start to feel bad and might give up entirely. But as long as the goals are doable and you don’t stress over them too much, I think they’re a good thing 🙂 And your goals sound great! I had reading more classics as a goal year, but I didn’t both this year. I just don’t tend to like them much, but I still like to read originals before I read retellings, so I’ll continue to do that. Good luck with all your goals! Yeah, I love having goals, but sometimes if they put too much pressure on me, I’ll lower them or maybe take a break. Falling behind in goals is just such a terrible feeling because like, you don’t feel like you’re good enough? Thank you! I never read classics unless it’s for school (and normally we don’t ever read any good ones), so I’d like to change that. Good luck finishing off your novel!! I HOPE YOU DO. I have a lot of writing projects to work on this year and aghhh deciding between them is super hard. But I’d like to write 2 novels and read 200 books, because apparently I like the number 2 this year. Aww, that makes me so sad. 🙁 Not everyone has enough time or like not everyone is a super fast reader, so it’s just different for everyone. I don’t think anyone should ever feel bad because someone reads more books than they do. Thank yous so much, Cait! I really love the idea for my novel (that sounds kind of self-centered? ), but it’s just hard to get it all out right. I always have lots of ideas floating around in my head, but there are definitely some I like more than others. Good luck with your novels and reading goal, as well! I like setting small goals because it gives me something to work towards – it helps challenge myself with reading more diverse books that I wouldn’t usually pick up, and it allows me to keep moving forward with my own WIP. All the best for 2017 and hope you get to finish your own novel. Exactly! One of my goals is to work on reading more diverse books, too. Thank you, and good luck with your WIP too. 🙂 Happy New Year!